How is the income estimate calculated? For each job, we calculate an income estimate so that you know how much this job is worth. When you're in a job, you see that an income estimate is calculated on the left. This income estimate is calculated according to the rates you defined at the client level for this service (People > Clients > Services). This estimate is excluding taxes and does not take account of any discounts given on the invoice. If no rate is defined at the client level, we are unable to estimate the income for the job (and we tell you that with a message in the job). If you created a quote for this job, the income estimate will be the same as the job line total in the quote. 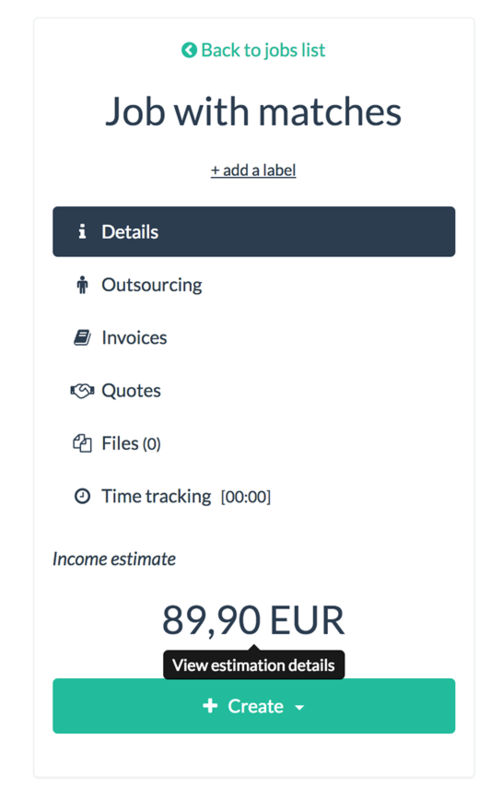 If you selected the 'Time-based invoicing' option for the job, the income estimate will be calculated based on your time tracking entries for the job. If the job has already been invoiced, the price quoted is no longer an estimate but is the actual amount invoiced. To view the details of the income estimate calculation, you can click on the amount. You can edit your rates in that pop-up and the system will automatically update your rates at the client level.